Get your book reviewed. There are lots of different types of reviews. Editorial review are generally the most expensive ($299+). These reviews are by neutral third parties (yes, we do those) where an editor reads and reviews your book. You are then allowed to use that review in your marketing materials, on the cover, etc. But you can also leverage the blogger network. What does this mean? I call it the ripple effect. If you have an amazing, compelling book – it will be successful. Remember the last time you read a truly excellent book – didn’t you want to tell everyone about it? There are quite a few bloggers that will read and do reviews for books they are interested in, some of them are even free. But it takes time, perseverance and research. There are several companies that will also manage the process of getting these reviews for you (yes, we do that too). Other options include contacting local media, newspapers and television. You’ll have a better chance of being talked about in your local news if you present your story in an interesting way for the editor of that outlet. Media outlets are always looking for more content that they can provide to their readers. Use your social networks. This seems obvious but you don’t need to spam your friends and family. However, getting a mention to your book, a link, a like, a post can help a friend of a friend of a friend find your book. And don’t forget for every reader you have, your circle of influence expands. Social networks don’t have to be limited to online contacts. I was recently checking out at a store when the woman in front of me struck up a conversation with the cashier. She said something to the effect of, “I think that you would like my music. I just finished recording this and I’d like to share it with you.” She then left a copy of a CD with the surprised and pleased employee. That made an impact. Donate when you can. There are libraries and schools near you that are always in need of new books. Find out how you can donate a copy or two of your book to them. They may have an area where they spotlight new books or local authors. Take advantage of this free publicity. Many of these library employees are in the business of recommending books on a daily basis. Also, don’t overlook that many retirement homes or senior citizen centers could benefit from your book as well. All donations are tax deductible either as charity or as a marketing expense. Ask your tax advisor for more information. Sponsor a book club. There are thousands of book clubs all over the world that meet in person and online to read and discuss a specific book. Contact the leaders of these groups to suggest your book as the book of the month/week, donate it or offer to speak to the group personally for a question and answer session. Everyone loves to get a little “special attention” when they are involved in running or participating in a book group. These experiences give you an opportunity to form relationships with people that can become “super fans” and help grow your reputation while increasing awareness about your book. These are just a few ways to increase awareness for you and your book. Most are fairly low cost but all involve forming relationships with people. You can download more marketing ideas free at http://www.entradapublishing.com/marketing_guide.html to get you started. You can do this next step! Just take a few minutes to brainstorm your ideas and write them down, including the ones that you had while reading this article. Your book won’t sell itself. It need a little help from you – but don’t forget…YOU CAN DO it! Rachel Smith is the lead acquisitions editor and marketing manager at Entrada Publishing. She works with beta readers, editors and authors to get books into selling and award winning shape. She prides herself on having found two authors through beta reading for publication, holding their hand every step of the way and celebrating when they signed their first book deal contract. You can get help with all areas of book marketing, book reviews, beta reading, cover design and more at www.entradapublishing.com. Found on the blog The Sprint Shack. 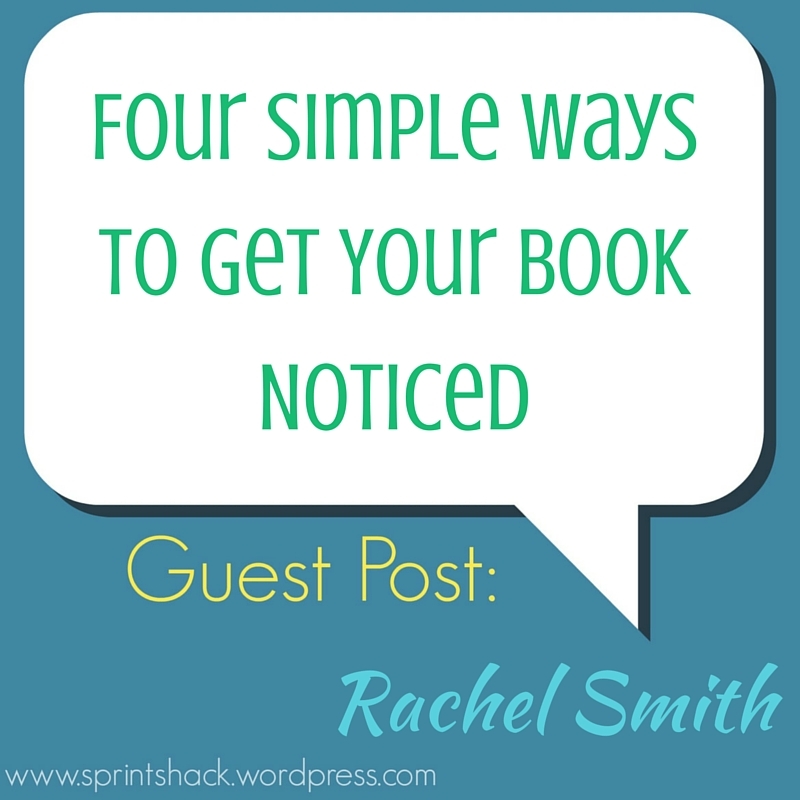 Sounds like some good advice for anyone seeking to get a book noticed!